A synergistic blend of time tested herbs for the glandular system. Ingredients: Mullein & Lobelia in a base of 100% Pure Olive Oil. 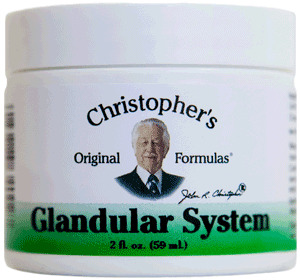 Dr. Christopher's time tested Glandular System Ointment supports the body's glandular functions. Also available in Capsule & Oil form.